Why it matters: Linking a phone to your PC isn’t the most natural of experiences. There are third-party apps for file swapping and notifications like the excellent Pushbullet, along with services such as Dropbox, but Microsoft says it is offering something better with its Your Phone app, which is "coming soon" to Windows Insiders in the Fast ring. Microsoft unveiled the Your Phone app at its Build developer conference back in May. Essentially, it creates a link between your smartphone and PC, allowing desktop or laptop users to transfer photos/files, get notifications, and access texts. It also links web pages between the two devices, letting you continue browsing sessions on your PC straight from where you left off on mobile. Now, Microsoft says it will soon start testing the Your Phone app in its latest Windows 10 Insider Preview build 17728 (Redstone 5). The company writes that in the coming weeks, Android users will see a link on their desktop taking them directly to the Your Phone app, allowing them to instantly access their phones' content. They’ll be able to simply drag and drop photos and files from a handset directly into a desktop app such as PowerPoint. Text message synchronizations and notifications are being added later. The app is supported on handsets running Android 7.0 and higher. It will eventually arrive for iPhone users, but functionality will be limited to sharing web pages between mobile device and PC. 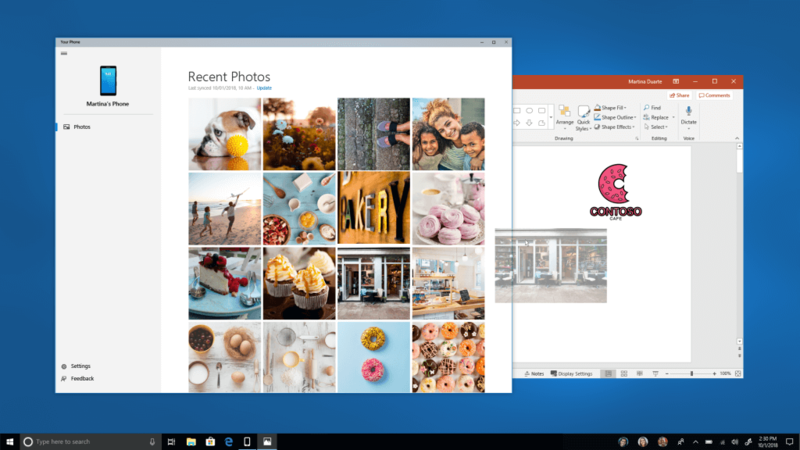 Microsoft is also adding several minor improvements and changes in the new Windows build. You can check out the full details here.